What was I up to today? Between 11 am and 1 pm, I went to Chapters to celebrate the launch of Mark Leslie and Jenny Jelen’s Spooky Sudbury: True tales of the eerie and unexplained, which just happens to feature a wee tale from yours truly as well as a number of my friends: Kim Fahner, Mat Del Papa, Charlie Smith, Rob Sacchetto, and a pile of other local contributors. Sudbury Swag Bag. 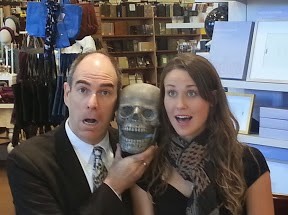 I met Jenny, and hung out with Scott Overton, Kevin Closs, and a crowd of other people. Really. It was a crowd. 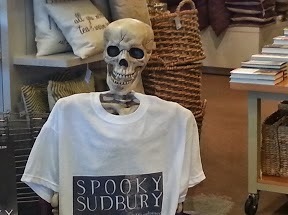 An hour into their three-hour stint at Chapters, Mark and Jenny were sold out. Fans were heading down to Costco to buy copies and bring them back for Mark and Jenny to sign. This afternoon, Mark and Jenny were at Coles in the New Sudbury Centre, and tomorrow morning, from 10 am to 12 pm, they will be at Costco. 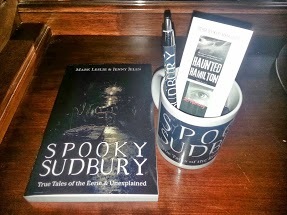 This will be your last chance, Sudbury, get your copy of Spooky Sudbury before they’re all sold out and read the true tales of the unexplained through the month of October. 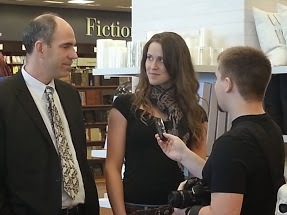 Getting interviewed-yes, the media was there too! Mind you, you can always go online and order a copy. Either way, it’s scary stuff, kids (in my best, Count Floyd voice)! What writerly fun have you been up to this weekend? Thanks, dear. It was a lot of fun. Usually, author signings and book launches don’t get a lot of action in this town unless they’re held at a lisenced venue 😉 But Mark and Jenny had a great turnout. I’m really happy for them, and by extension for me!